The Ecowec hybrid heat exchanger recovers thermal energy from all wastewater and other sources of waste heat, including exhaust air, cooling processes, and solar power systems. The hybrid exchanger is suitable for use with any type of heating and cooling systems (such as district heating, ground-source heat pumps, and oil-based central heating). It can be either installed in the construction stage or retrofitted during renovation. Ecowec offers an ideal solution for any building that generates large volumes of wastewater, including blocks of flats, hotels, industrial facilities, spas, public pools, and other public buildings. In a residential building, a single Ecowec hybrid heat exchanger can process wastewater generated by up to 60 households. To increase capacity, several exchangers can be installed in a series or parallel arrangement, thereby enabling cost-efficient processing of large quantities of wastewater. The Ecowec hybrid exchanger is unique in that it can be installed even for properties with a single-pipe system. In this drainage system, wastewater from toilets is carried by the same pipe as all the other wastewater. With an Ecowec hybrid exchanger, there is no need to separate wastewater types, store the wastewater for the heat recovery process, or clean the heat exchanger. These characteristics make an Ecowec system an extremely cost-efficient solution for both new construction and buildings undergoing renovation. An Ecowec heat exchanger can help you considerably reduce the time it takes for renovation to pay for itself. The expected service life of typical HPAC equipment is around 20 to 30 years. An Ecowec unit’s service life, however, is 40–50 years at minimum, matching the life span of the property’s drain system. As the system is almost maintenance-free, its use does not create any post-investment costs. Complete with a remote monitoring system, the heat-exchanger unit does not require inspection or service visits. With Ecowec products, the amount of energy used to heat a property can be reduced by up to 30%. The Ecowec system pays for itself in under 10 years, and the efficiency of its heat recovery is up to 30–70% on an annual level. In new buildings, the Ecowec hybrid heat exchanger can replace costlier, less efficient solutions, thereby resulting in lower construction costs. Thus, the system pays for itself instantly. The Ecowec system is by far the most cost-efficient way of reducing your property’s energy use. It recovers the heat from wastewater and cycles it back into the heating system. This takes place in a simple process, via a simple device. 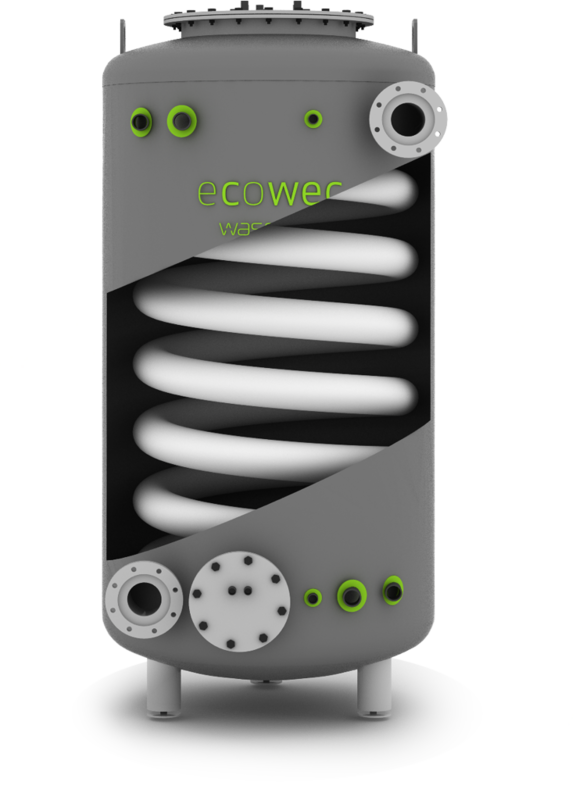 In the Ecowec system, the intermediate fluid in the spiral tube inside the device captures heat from 30-degree wastewater, making it available for use in preheating for hot water, for instance. Ecowec utilises additional heat exchangers to transfer heat to the hot-water system, so the wastewater and domestic water are separated by two heat-transfer surfaces. This prevents wastewater from coming into contact with domestic water, thereby eliminating any risk of contamination. The Ecowec system meets the requirements set for materials and heat-exchanger surfaces in the National Building Code of Finland. Ecowec units differ in operation principle from a standard thermal store. Heat is not stored in the Ecowec system but recovered and reused almost simultaneously. This feature distinguishes it from other systems. For instance, in solar energy systems, energy is generated only during daytime or in the warm season and then stored in an accumulator or thermal store or fed to the power grid. By feeding recovered energy directly back to the property’s heating system, the Ecowec solution eliminates the need to invest in expensive accumulators or thermal stores and prevents any problems related to low feed-in tariffs encountered with grid-connected solar power systems. With the Ecowec system, wastewater heat can be put to better use also in the design of low-energy and passive houses. The system is an ideal solution for both new builds and renovation projects. This system for recovery of heat from wastewater can be either installed in the construction stage or retrofitted during renovation (for example, when pipes are being replaced). Thanks to its compactness, an Ecowec unit occupies only around one square metre of floor space and can be easily installed on older properties. The installation and operation of the system do not affect the day-to-day life of the building’s occupants. For example, the device can be placed in a cellar. This way, the appearance of older, protected buildings does not change and planning requirements do not impose any restrictions on the use of the system. The eco-friendly Ecowec system does not use any electricity, contain any moving electromechanical parts, cause odours, or emit noise. It helps to reduce energy costs with all heating systems by sending heat from wastewater back to the property for reuse. With the Ecowec heat exchanger, consumption of heating energy can be cut by 25–30% in new zero-energy and passive houses, in which wastewater can account for more than 50% of the building’s thermal balance. The system also enables the installation and use of lower-capacity heating systems both on new properties and in buildings that are being renovated. In renovation projects, Ecowec systems provide great results for a significantly smaller investment than is required with an additional layer of external wall insulation, new windows and doors, a solar power system, or installation of a more efficient ventilation-heat recovery system. The system can, however, be connected to various systems, such as one generating heat or electricity from renewable (e.g., solar) energy, or it can be integrated into a system for recovery of heat from exhaust air. Thanks to these characteristics, Ecowec helps to reduce renovation costs and generates considerable savings in the course of the system’s service life. The Ecowec system assists in the reaching the energy-efficiency goals set for renovation projects, thereby rendering the renovation work more cost-efficient. The Ecowec heat-exchanger system can create considerable savings for a property. It is extremely efficient, recovering even 30–70% of the heat going down the drain with wastewater, which results in a considerable reduction in the energy use for heating. The hybrid heat exchanger is suitable for both new buildings and those undergoing renovation. With the Ecowec heat-exchanger system, every block of flats, commercial building, hospital, public pool, spa, and hotel can recover heat from its wastewater, for use in its heating system. What’s more, Ecowec offers a solution for several environmental challenges, including the requirements set for sustainable development and construction and the restrictions imposed on the use of fossil fuels, particularly coal. Ecowec truly represents cleantech at its finest. This is also an investment that pays for itself. It can recover up to 30–70% of the heat that goes down the drain with the wastewater, creating a 10–30% reduction in a property’s annual use of energy for heating. With rapid return on investment, Ecowec starts saving you energy costs in no time. In addition, the system is extremely easy and cost-efficient to use and maintain. With no electromechanical parts subject to wear and tear, it requires only a very low level of maintenance. Ecowec has an overflow system that serves as a backup in the event of blockages or other problems. The device’s principle of operation is based on gravity, and the system does not need electricity.